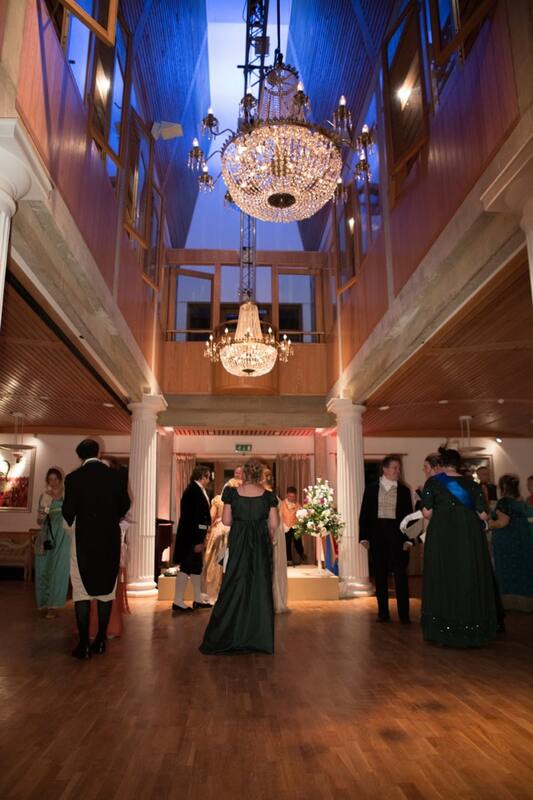 As part of the celebration of the 200th anniversary of the novel “Pride and Prejudice”by Jane Austen, Lucy Cavendish College, Cambridge, organised a conference culminating into a Regency Ball. We were appointed to manage, design and deliver this highly unusual event. To re-create the appropriate ambience, we hired regency dance caller, Stuart Marsden, and the period band, ‘Boldwood’. As well as period specialists, who taught guests card games appropriate for the era and the floral displays contained flowers mentioned in the iconic book. Chandeliers were installed to add a touch of opulence, and the mixture of modern lighting and candles achieved a candle-lit experience. The modern pillars were padded and covered with cladding, appropriate to architecture of that time. Outdoor areas were provided with luxury gazebos, seating and carpet (to avoid ladies’ heels sinking into the lawn!). Costume hires were managed for the guests, and dance lessons were available before the ball so everyone had a chance to find their own Mr Darcy or Miss Bennett!